Read Roundtable Feature Story: "Are We Closing in on Dark Matter?" IN MID-OCTOBER, more than 100 cosmologists, particle physicists and astrophysicists gathered to take stock of the latest theories and findings about dark matter, assess just how close we are to detecting it and spark cross-disciplinary discussions and collaborations aimed at resolving the dark matter puzzle. Roger Blandford, Director of the Kavli Institute for Particle Astrophysics and Cosmology (KIPAC) at Stanford University and the SLAC National Accelerator Laboratory, attended and helped organize the dark matter meeting in Southern California. Dr. Blandford spoke separately with The Kavli Foundation before the meeting ended. 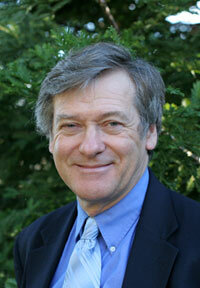 Dr. Blandford is a Professor of Physics at Stanford University and at the SLAC National Accelerator Laboratory. Dr. Blandford’s research interests include cosmology, black hole astrophysics, gravitational lensing, galaxies, cosmic rays, neutron stars, and white dwarfs. THE KAVLI FOUNDATION (TKF): Why is it so important to bring together dark matter researchers now? ROGER BLANDFORD: Because there has been so much progress toward discovering dark matter that is highly relevant to all of us. We haven't yet found dark matter, but we are now using exquisite techniques that are tightening the constraints. TKF: The Large Hadron Collider at CERN is searching for supersymmetry – that is, this idea that elementary particles have a kind of shadow world of mirror particles – and among them may be the dark matter particle. BLANDFORD: Yes. That was the main reason for building it. However, I think the state of play is that there is no convincing signal yet, or even an unconvincing signal, that one would interpret as evidence for supersymmetry. But the other way of stating it is they have ruled out a lot of possibilities, and further validated the standard model in many, many ways. TKF: What were you encouraged by at this meeting on the direct detection front? BLANDFORD: I am most impressed by the relatively rapid progress in sensitivity of yet more approaches to seeking dark matter, or particles associated with dark matter. I think the speed with which these experiments are being brought up is very, very encouraging. Now it remains a quite possible outcome that, at the end of the day, we reach a floor and going beneath that is really not practical or feasible. That it just gets too hard to be more sensitive. But we are not there yet, and so there's still quite a lot of discovery space that is open for the experimentalists. They may find nothing; but in my book, that is still discovery. TKF: As we’ve heard at this meeting, in the case of dark matter, nature doesn’t guarantee that we’ll ever detect it. BLANDFORD: That is completely right. Furthermore we cannot even rule it out. Half-asleep theorists can evade any of these experimental bounds. TKF: What is it about dark matter that is so vital to cosmology? BLANDFORD: It is five-sixths of the matter in the universe, and over a fifth of the total energy content in the universe. It seems rather embarrassing that we don't know what it is. All we can do is detect its generic properties, particularly its gravitational properties, but we cannot identify it. I think that's a pretty basic human quest – to try to understand this major component of the world around us. It's a great detective story. There's a strong possibility – but not a guarantee – that we will identify the nature of most of the dark matter in our lifetimes. I cannot guarantee it's going to happen tomorrow, but there's a sense the opportunities to do this are there. Nature may cooperate and nature may not. Still the experiments and the observations are feasible. This isn't a situation where we don't know what to do. We may fail, but it's well worth trying. TKF: Isn’t the bulk of the evidence for dark matter the detection of its gravitational effects on ordinary matter on large scales? BLANDFORD: Yes that’s right, although the idea of supersymmetry rests on a lot of experimental physics. TKF: On the observational front, what most encourages you? BLANDFORD: I would rather invert the question and say, “What am I discouraged by?” And the answer is, “Nothing.” None of the approaches that we have been discussing so far here have I found discouraging. In each of the areas we highlighted, I see rapid progress experimentally. TKF: As the window for physical evidence narrows, the theorists also have to narrow their range of possibilities. BLANDFORD: I also see my theoretical colleagues getting much more hard-nosed and responsible about what's going on. They are confronted with serious constraints; this is not free-form and they are not allowed full reign to their imaginations. It’s getting much more focused on realistic approaches which will change quite rapidly now. Models will be ruled out, and experiments might no longer be motivated. Theorists can help here. This happened in cosmology. There was a time when it too was almost completely free-form, because there were relatively few solid observations. And now there are many, and they are reproducible, and they are corroborated and so on, and much of what you might've speculated on 40 or 50 years ago is completely unacceptable nowadays. TKF: Of all the different communities now searching for dark matter – the direct detection community, the indirect detection community, and the particle accelerator community – there seems to be a particular competition among people looking to make a direct detection. Why is that? BLANDFORD: That's a very interesting question and I'm not quite sure. You could say they're very competitive, but a lot of groups are like this. However, I think the “prize” is more clearly in front of them than in the other communities. Particle physicists are doing particle physics. The LHC, if they don't break it again, will continue to be a great success. It has found the Higgs almost certainly, and it has validated the Standard Model as we said, in countless ways. Even if it does nothing else with physics beyond the Standard Model, it will still be a glorious success. TKF: The success of the LHC does not hinge on the discovery of dark matter, whereas the numerous dark matter detector experiments around the world are built for it. BLANDFORD: The direct experiments are specifically designed to find dark matter and there is very little else that could come out of them. Of course, they could make very great discoveries in solid-state physics along the way, but it is unlikely. By contrast, those involved with the indirect detection efforts are winners already. They have transformed our understanding of gamma ray astronomy. Detecting dark matter would be wonderful, but the astrophysical success already vindicates constructing these facilities. TKF: If we cannot observe dark matter any time soon, do we keep pushing toward better technology and techniques? BLANDFORD: We push until it becomes impractical to man the experiments, to go much further. It's a bit like the obstacles we had studying the cosmic microwave background radiation (CMB) from the very early universe. The first time we started talking about measuring temperature fluctuations in the microwave background in the mid-60s, nobody imagined that you would be talking about nano-Kelvin experiments to distinguish vanishingly faint differences in temperature. But that's what we’re doing now. TKF: So our search for dark matter may require another 30 or 40 years before we have the technology to detect it. BLANDFORD: It might take that long but the search for dark matter today is different from the challenges we faced with the CMB, because back in the 1960s we didn’t propose nano-Kelvin experiments. Only later did we acquire the technology to even consider making those kinds of measurements. Today, we know what we need. Of course, building the instruments is still daunting. And I think there's a sort of practicality limit in terms of funding, in terms of risk, and in terms of the techniques that have to be developed. At that point, young people in the community will vote with their feet if they perceive this is a fool’s errand. But until you reach that point – until nature tells you it's too hard – you keep on going. And I think that's what will happen.